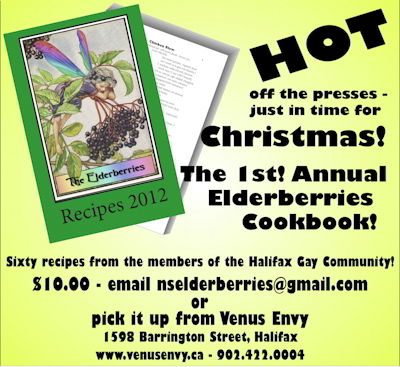 In November, 2011, the ElderBerries published a fundraiser recipe book featuring seventy beloved recipes from the members' kitchens. The cookbooks sell for $10 each. There were discounts associated with the first printing and they sold out quickly. For the second printing, all cookbooks are $10. 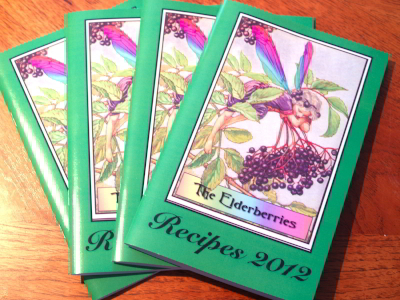 The recipe books are fund raisers for Elderberries functions -- to pay for meeting space, transportation and small gifts for guest speakers, stationery & stamps, printing costs for the promotional brochure, and supplies for the pot lucks. VenusEnvy, 1598 Barrington St, 902-422-0004. Venus Envy is selling this with all proceeds going to ElderBerries so cash sales only please.